Now that the , it’s only a matter of time before AMG gives the sleek sedan more power and a sporty makeover. We got our first look at a last summer, and the camouflage is starting to come off as the side profile and sloping roof of this latest prototype is fully exposed. That said, the AMG design elements are still well hidden, with camouflage covering the Panamericana grille and the more aggressive bumper with larger air intakes. At the back, more camouflage disguises the car’s rear bumper, spoiler, diffuser and AMG's signature quad exhausts. The prototype also sits lower to the ground and appears to have wider wheel arches than the regular CLA, although the camouflage could be deceiving us. As for the powertrain, the potent sedan will be powered by a turbocharged 2.0-liter gasoline engine in two states of tune: the CLA 45 will offer 383 hp, while the more powerful CLA 45 S will have 416 hp on tap. 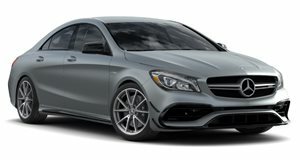 Like the A45, the range-topping CLA will be offered with a 4Matic all-wheel-drive system linked to an eight-speed, dual-clutch automatic transmission. It will also inherit the for when you’re in the mood for some sideways action. Don’t expect the AMG CLA 45 to break cover any time soon, however. Mercedes-AMG will most likely reveal the A45 and A45 S hot hatchbacks first, followed by the CLA 35 before the range-topping CLA 45 arrives. The more could also potentially get the AMG treatment later down the line, but don't hold your breath for it to go on sale Stateside if it does.